At milepost 45 on State Route 95, an open spandrel, steel deck arch bridge crosses the Dirty Devil River. A couple of miles further down State Route 95, a through arch bridge crosses the Colorado River at Hite (shown on February 11th). The bridge over the Dirty Devil River is perhaps less spectacular than the landscape that surrounds it. I wonder how difficult it is to maintain bridges in Utah? This desert used to be an ocean, and the Dirty Devil River adds 150,000 tons of salt to the Colorado River every year. 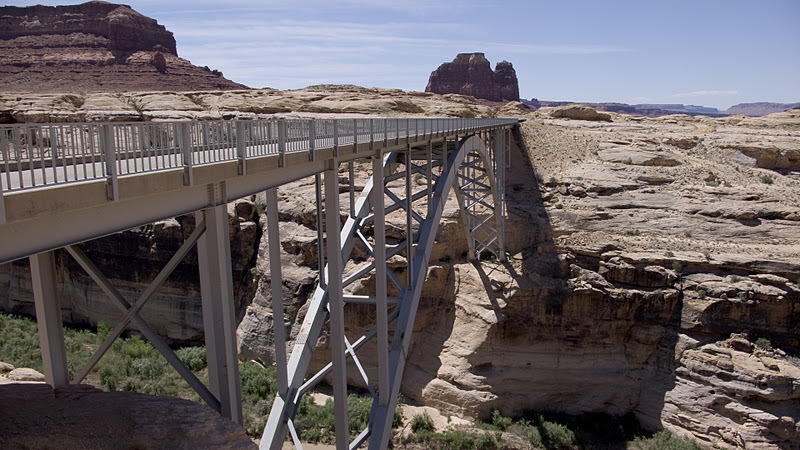 Still, there isn't much rain or snow in the high desert, and bridges should age slowly. There are also a number of stone arch bridges at Natural Bridges National Monument a couple of miles farther down State Route 95. Arch Bridges: Dirty Devil River Bridge by Mark Yashinsky is licensed under a Creative Commons Attribution-Noncommercial 3.0 United States License.